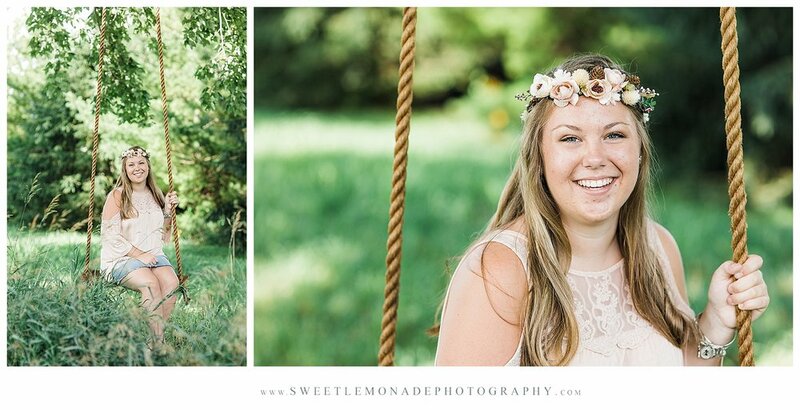 Ohhhh, we had so much fun the day of our floral crown sessions! We started by doing a mini session indoors because the weather was looking quite iffy. Mahomet had already received a couple of inches of rain earlier in the day and another storm was coming through late afternoon/early evening. But guess what... we lucked out and still made it outside to take more photos of each of the girls. The light was amazing! 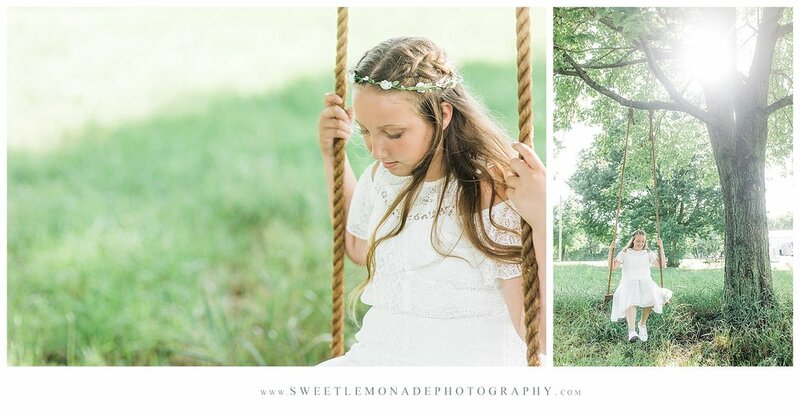 The swing that was built from reclaimed barn wood, and rope that was just as old, by one of these girls' dad. It made the outdoor pics all the more magical. There are several reasons why my desire to start photographing teens and tweens has gotten stronger. 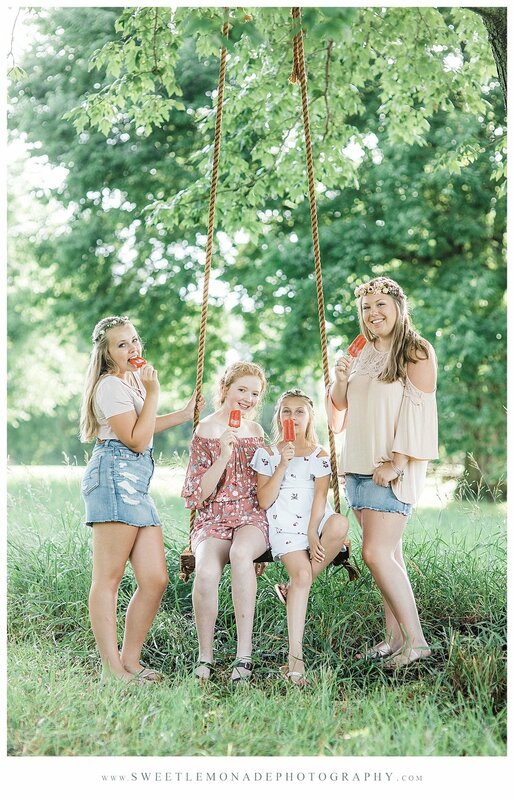 I love photographing seniors and there are so many reasons to have your child photographed in junior high, middle school or even earlier. 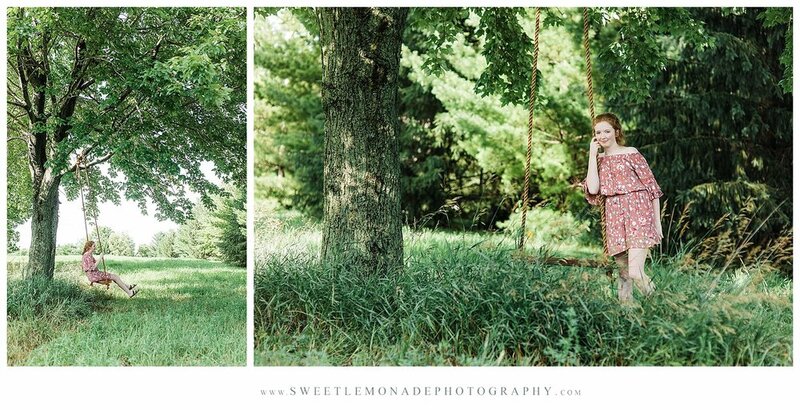 The biggest reason that has caused me to make a more concerted effort to photograph kids, particularly girls, when they are younger is to make sure they know they are beautiful, that God knows they are beautiful and they were created perfectly in His image. I'm a mom to 3 boys.... 7th, freshman and junior this fall. Crazy to think that in one more year, I'll be photographing my own boy's senior pics. eek! Raising boys can be challenging at times but the more I hear about the difficulties that girls face with bullying and other ugly behavior by their peers my heart breaks. I realize it's not only girls that suffer from this kind of abuse but it's rampant among females. I think it's so important to capture all the stages of your children's life. Don't just professionally document the first 5 years and then wait til their senior year. However, I find it's becoming even more important for their own self-esteem to not only know they are loved but also KNOW they are beautiful. I want them each to have a photo of themselves that they look at where they feel confident in who they are and how they look. I want each child to rock their own look, be their own person, and be proud of themselves just the way they are. Life is hard. Kids can be cruel. And I hate to tell you kids... adults can be cruel too so it won't end. But if you know your true worth then the things others will say about you, will not penetrate to your heart. I absolutely loved spoiling all these girls with professional hair and make-up and spending the afternoon with them. I'll be offering another round of floral crown sessions in my studio this winter. If you'd like to be notified when the spaces for the winter limited edition sessions is announced, sign up for my newsletter.